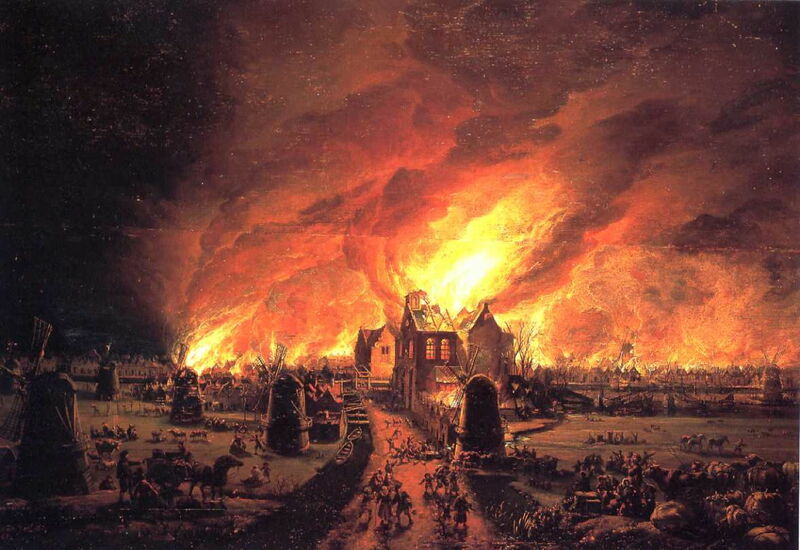 Egbert van der Poel (1621–1664), Fire in De Rijp of 1654 (1662), oil, dimensions and location not known. Wikimedia Commons. Control of fire is one of the fundamental skills of being human, and loss of its control is one of the common disasters to affect human habitation. Ever since we domesticated fire, it has had a habit of taking control and destroying our dwellings, property, and even ourselves. Artists have also depicted those fires. Here I have selected some examples of paintings which show fires on land in real life. There are scores more which depict fires that the artist has not witnessed – the destruction of Sodom and Gomorrah, the sack of Troy, the burning of Rome, for instance – but each of these works was painted by someone who is very likely to have witnessed the fire that they are painting, and may even have started their painting of it when the fire was still burning. Among these are some of the earliest examples of what the Impressionists specialised in, depictions of the transient effects of light, often painted en plein air. They are also good examples of fine art being used to record historical events. Until the advent of colour photography well into the twentieth century, painting was the only effective way to do that. Painting flourished during the Dutch Golden Age, and the proliferation of landscape paintings led to specialisation and sub-genres. Among them was the painting known as a brandje – a fire, usually seen at night. 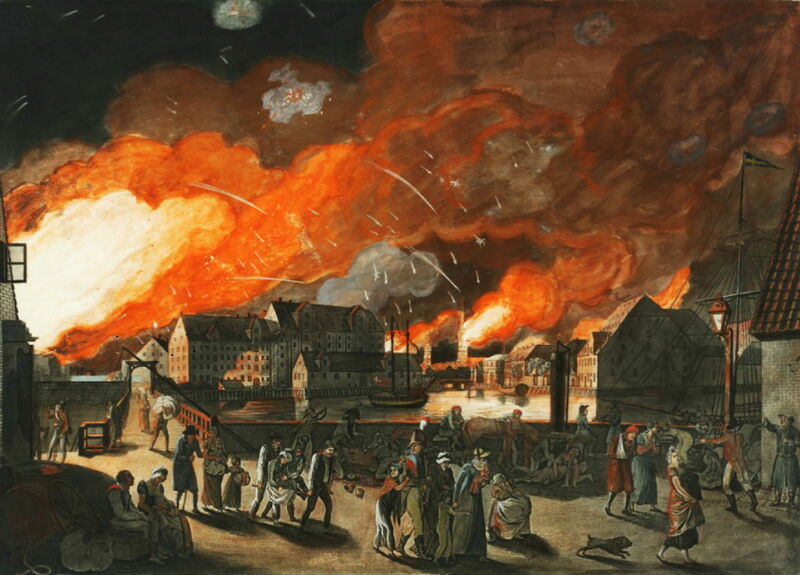 Frans de Momper (1603–1660), A Fire in Antwerp (date not known), oil on panel, 38 x 51 cm, location not known. Wikimedia Commons. Frans de Momper’s A Fire in Antwerp was probably painted around 1640, and shows a large fire occurring at night in the centre of Antwerp. 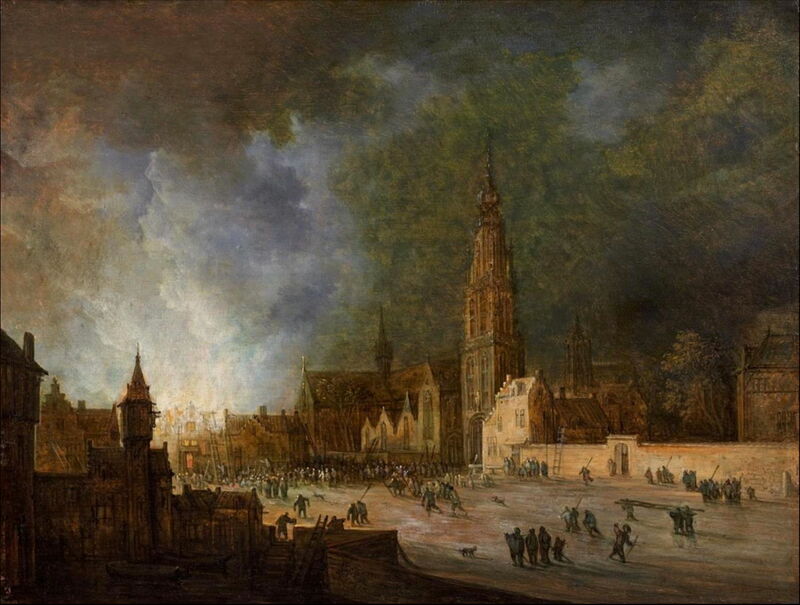 de Momper not only shows the crowds of people bringing ladders and tools to help, and the bright white light of the fire itself, but the huge pall of black smoke rising over the city. Jan Abrahamsz Beerstraaten (1622–1666), The Old Town Hall of Amsterdam on Fire, 7 July 1652 (1652-55), oil on panel, 89 x 121.8 cm, Amsterdam Museum, Amsterdam, The Netherlands. Wikimedia Commons. In mid 1652, Jan Abrahamsz Beerstraaten seems to have witnessed the destruction by fire of part of the centre of Amsterdam, which formed the basis of his studio painting of The Old Town Hall of Amsterdam on Fire, 7 July 1652 (1652-55). Local inhabitants are walking in orderly queues to boats, in which they escape from the scene. de Momper and Beerstraaten did not specialise in brandjes; Egbert van der Poel did, and probably painted more than any other artist in history. 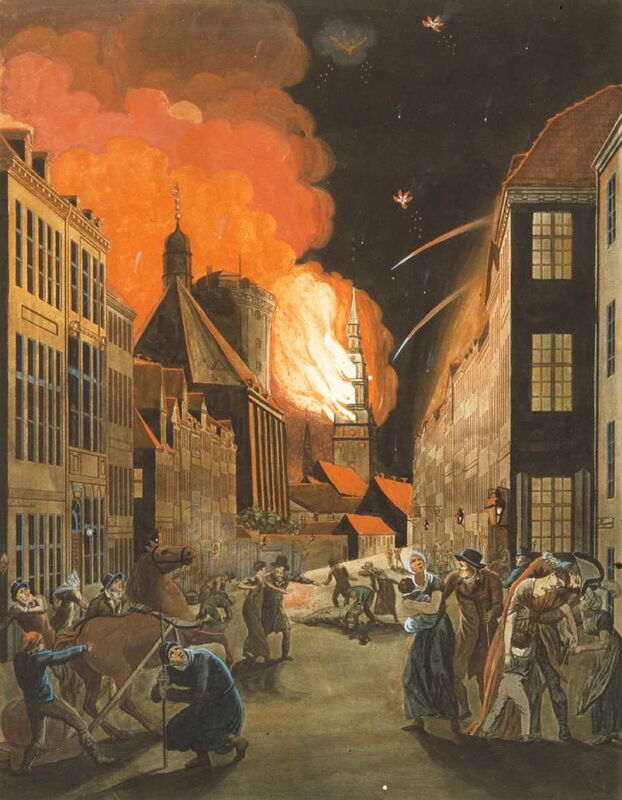 Van der Poel moved to Delft in 1650, and four years later was a victim of the massive explosion in a gunpowder store there on 12 October 1654. That killed one of his children, and he moved again to Rotterdam. 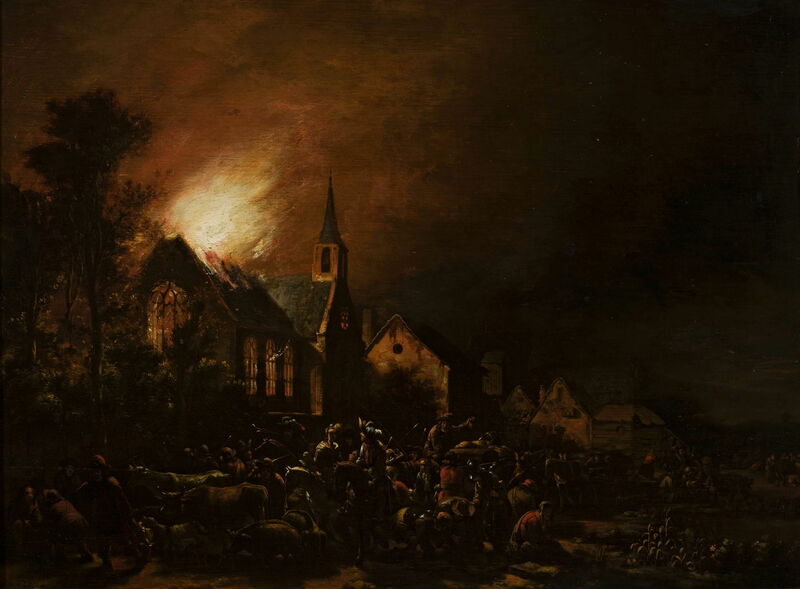 Egbert van der Poel (1621–1664), Fire of a Church with Staffage and Cattle (1658), oil on oak, 46.3 × 62 cm, Muzeum Narodowe w Warszawie, Warsaw, Poland. Wikimedia Commons. It has been thought that most of van der Poel’s Fire of a Church with Staffage and Cattle from 1658 is a carefully-composed fiction. A small church at the edge of a village is well ablaze, and the inhabitants are abandoning it, taking all the possessions they can, including their horses and livestock, and leaving the fire to burn itself out. Egbert van der Poel (1621–1664), A Fire at Night (date not known), oil, dimensions not known, Kelvingrove Art Gallery and Museum, Glasgow, Scotland. Wikimedia Commons. 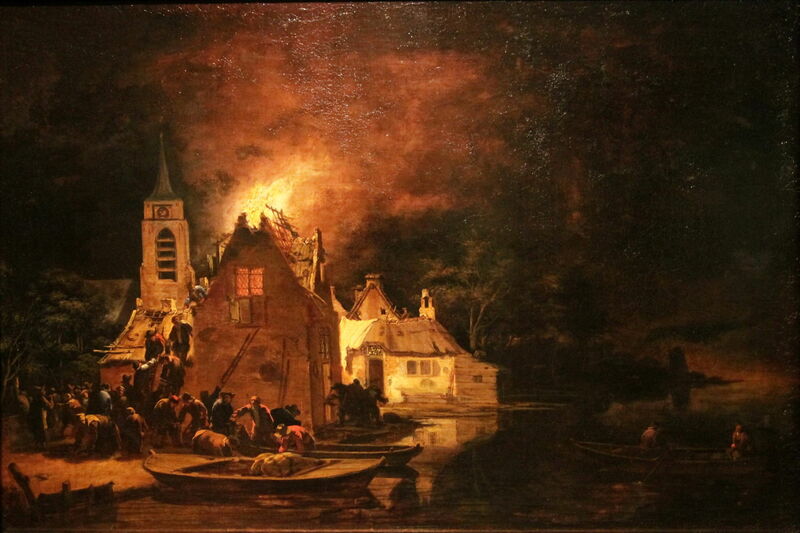 Van der Poel’s undated A Fire at Night shows a similar scene and composition, set this time on the bank of a canal. One exception to this is van der Poel’s Fire in De Rijp of 1654, completed in 1662. 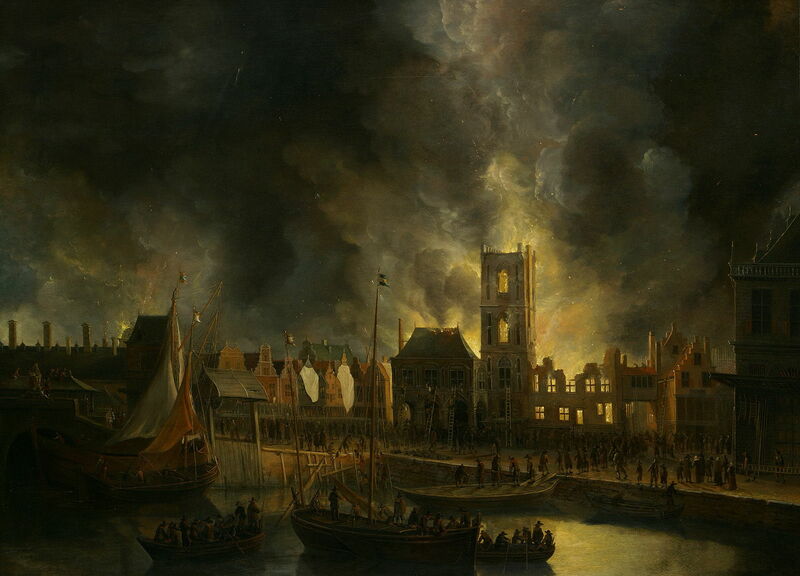 This shows a fire which worked its way through more than eight hundred buildings in the town of De Rijp during the night of 6 January 1654. This left only the northern section of the town standing and inhabitable, and resulted in more casualties than did the more famous explosion in Delft at the end of that year. Egbert van der Poel (1621–1664), The Fire in the Nieuwe Kerk, Amsterdam, in 1645 (c 1645), brush and gray wash and black wash with touches of pen and brown ink, 12.5 × 19.4 cm, location not known. Wikimedia Commons. 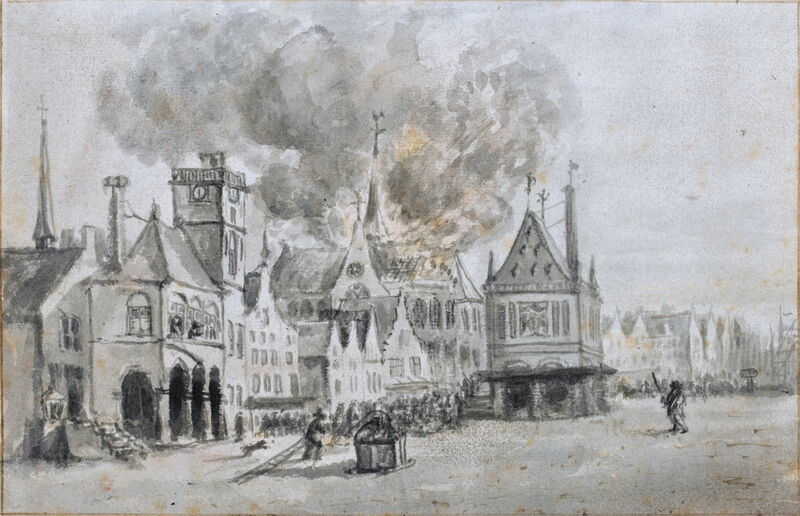 Doubt is cast on this received account of van der Poel’s work by sketches such as this, of The Fire in the Nieuwe Kerk, Amsterdam, in 1645, made in front of the motif using washes with touches of pen and brown ink. Perhaps he was the first ‘ambulance chaser’ who travelled out to sketch fires, from which he painted his famous brandjes in the studio. Adam Colonia and Philip van Leeuwen were followers of van der Poel who also specialised in brandjes, although both also painted other nocturnes, or maneschijntjes (moonshines) as they were then known. Jean-François Huguet (1679-1749), View of Notre-Dame de Bonne Nouvelle (1720-21), watercolour?? on canvas mounted on wood, 30.5 x 41 cm, Basilique Saint-Sauveur de Rennes, Rennes, France. Image by Édouard Hue, via Wikimedia Commons. 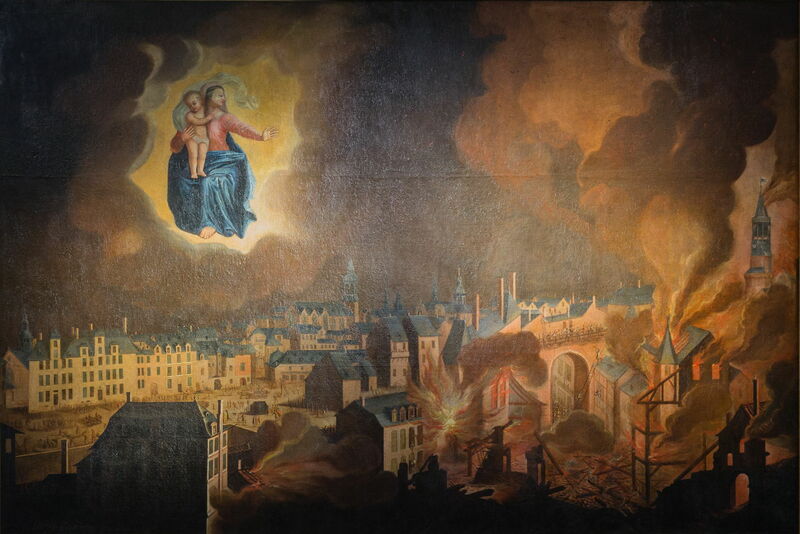 In 1720, the cathedral in Rennes caught fire, and burned from 22-30 December. The scene was painted in this View of Notre-Dame de Bonne Nouvelle (1720-21), shown here in a copy by Jean-François Huguet, which is claimed to be in watercolour on canvas. As with some earlier depictions of burning churches, the patron is shown watching the scene from the heavens. This painting underwent extensive conservation work in 2013, performed by Catherine Ruel and Kiriaki Tsesmeloglou. Francesco Guardi (1712–1793) (after), Fire in the San Marcuola Oil Depot, Venice, 28 November 1789 (1789-1820), oil on canvas, 22 × 36 cm, Rijksmuseum Amsterdam, Amsterdam, The Netherlands. Wikimedia Commons. 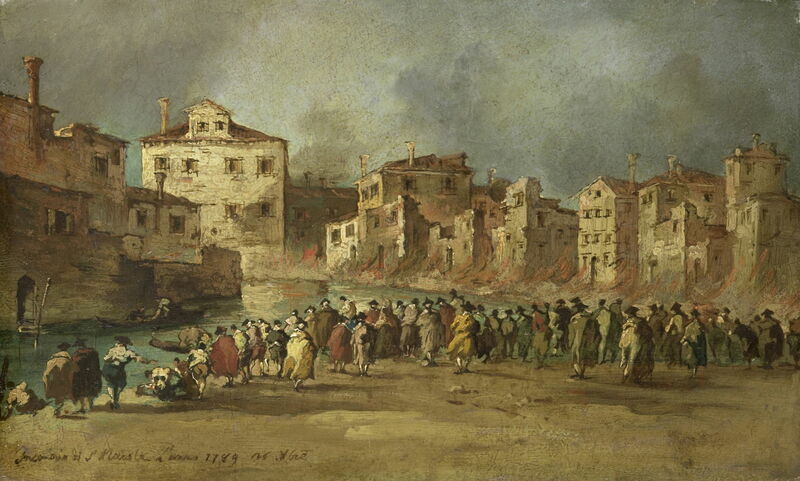 In the winter of 1789, Venice’s oil depot at San Marcuola caught fire. Although Francesco Guardi was 77 at the time, he painted the scene in his Fire in the San Marcuola Oil Depot, Venice, 28 November 1789. This is one of three versions of his painting; this is believed to be a copy made between 1789-1820, and is now in the Rijksmuseum, the others being in the Alte Pinakothek, and the Gallerie dell’Accademia. During the Napoleonic Wars, between 1803-15, civilians living in European cities were dragged into battles as their homes came under bombardment, and buildings were set alight. One example of this is the Second Battle of Copenhagen, in which the Royal Navy attacked the Danish fleet when in Copenhagen harbour. This brought much of the city under bombardment, which caused serious fires. Christoffer Wilhelm Eckersberg (1783–1853), The Terrible Bombardment of Copenhagen (1807), oil, dimensions not known, Det Kongelige Bibliotek, Copenhagen, Denmark. Wikimedia Commons. The Danish painter Christoffer Wilhelm Eckersberg was a student in the city at the time, and painted several works in which he depicted the effects of the bombardment, including The Terrible Bombardment of Copenhagen (1807), which shows the Church of Our Lady well ablaze. Christoffer Wilhelm Eckersberg (1783–1853), Copenhagen, the night between 4 and 5 September 1807 seen from Christianshavn (1807), oil, dimensions and location not known. Wikimedia Commons. In Copenhagen, the night between 4 and 5 September 1807 seen from Christianshavn (1807), Eckersberg gives a broader impression of the effects on the port area at the height of the bombardment. When Napoleon’s army approached Moscow in the summer of 1812, most of the city’s residents fled. 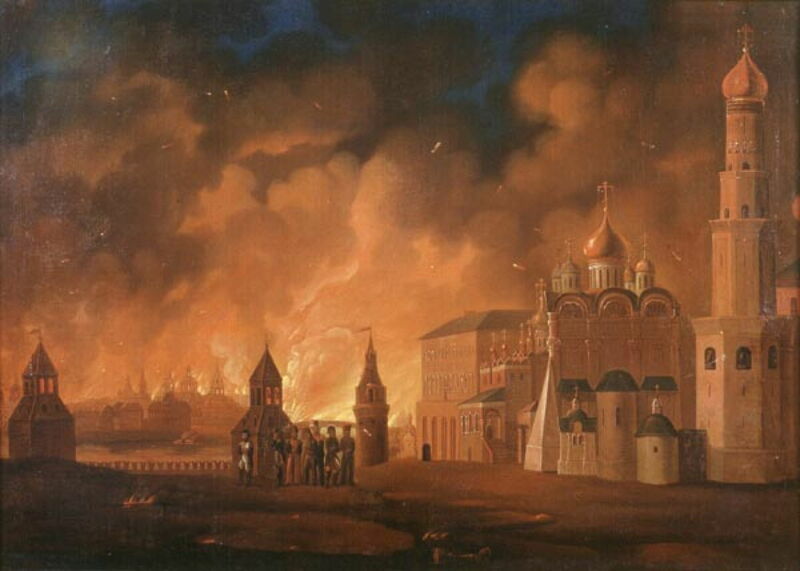 When the French army was entering the city on 14 September, following their success at the Battle of Borodino, on the orders of Count Rostopchin, the few remaining Muscovites set fire to some of its major buildings before fleeing. By the following day, a massive fire was burning in Kitay-gorod, at the heart of the city, and that didn’t burn itself out until 18 September. A. F. Smirnov (dates not known), Fire of Moscow in 15-18 September, 1812, after Napoleon takes the city (1813), further details not known. Wikimedia Commons. There are many paintings showing different views of this catastrophic fire, but A. F. Smirnov’s Fire of Moscow on 15-18 September, 1812, after Napoleon takes the city (1813) is probably one of the best. It is thought that two-thirds of all private dwellings, most shops and warehouses, and more than a third of all churches, in the city of Moscow were destroyed by the fire over those four days, and 12,000 bodies were recovered. Posted in General, Life, Painting and tagged Beerstraaten, brandje, de Momper, Eckersberg, Golden Age, Huguet, maneschijntje, painting, Smirnov, van der Poel. Bookmark the permalink.